Okay. This is what everyone keeps asking about. Today we will provide an actual sample of a Monthly Maintenance Checklist. Last time we talked about Why We Do Monthly Maintenance. Before that we covered Monthly Maintenance Scheduling and On Site Visits. Below is a sample Monthly Maintenance Checklist. Of course you will customize this for each client. Of course some of your processes and procedures are different. Of course some of this is automated by your RMM (remote monitoring and maintenance) tool. But if you have nothing, this is a great place to start! As a general practice, we keep all the client monthly maintenance checklists in one folder on the company SharePoint. The main reason for this is that it is much easier to update them all if there's a big change. We could store them in the PSA (professional services automation) tool, but that's only convenient if you are updating checklists one at a time. 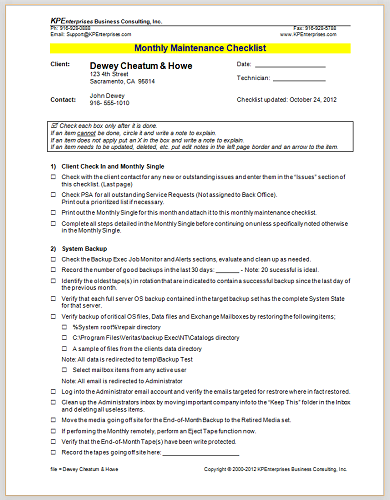 Other than section titles, each line begins with a small box suitable for entering a check mark or X. It is critical that everyone understand that the task must be completed before the box is checked. --> Check each box only after it is done. - If an item cannot be done, circle it and write a note to explain. - If an item does not apply, put an X in the box and write a note to explain. - If an item needs to be updated, deleted, etc. put edit notes in the left page border and an arrow to the item. - Check PSA (e.g., Connectwise, Autotask, PacketTrap) for all outstanding Service Requests that are Not assigned to Back Office. Print out a prioritized list if necessary. - Print out the Monthly Single for this month and attach it to this monthly maintenance checklist. - Complete all steps detailed in the Monthly Single before continuing on unless specifically noted otherwise in the Monthly Single. - Make a time stamp entry for the Monthly Maintenance in the Network Documentation Binder Tech Notes. - Investigate significant findings from the Event Logs and if necessary add them to the “Issues” section. - Print out the Tech Notes file and put it into the Network Documentation Binder. Note: When performing the Monthly Maintenance remotely, verify the on site contact has printed,stapled, punched and put the notes into the NDB. - (with older Exchange servers) Check incoming and outgoing messages in the Exchange queue to verify there are no spam issues. - Check system drive space availability. - Check system drive fragmentation status. - If any drive is over 1.25 fragmented, schedule a one-time defragmentation of that drive for 5:00 pm. - For any system requiring defragmentation, create an SR to check on the status of the defragmentation. - Check UPS logs, UPS run time and if required run any UPS maintenance. - Update the Network Documentation Binder Tech Notes with relevant information from this section. - Note all unresolved problems from this section in the “Issues” section. Note: When performing the Monthly Maintenance remotely, verify the on site contact has made these entries in the NDB. - Check the Backup Exec Job Monitor and Alerts sections, evaluate and clean up as needed. - Record the number of good backups in the last 30 days: _______ - Note: 20 successful is ideal. - Identify the oldest tape(s) in rotation that are indicated to contain a successful backup since the last day of the previous month. - Verify that each full server OS backup contained in the target backup set has the complete System State for that server. - Log into the Administrator email account and verify the emails targeted for restore were in fact restored. - Clean up the Administrator's inbox by moving important company info to the “Keep This” folder in the Inbox and deleting all useless items. - Move the media going off site for the End-of-Month Backup to the Retired Media set. - If performing the Monthly remotely, perform an Eject Tape function now. - Verify that the End-of-Month Tape(s) have been write protected. - If there are fewer than 6 tapes available (12 for a two tape scheme, etc.) include this information in the Monthly Maintenance Follow Up Email. - Verify the tape drive has been cleaned – Three times for a DAT and once for DLT or SLR. Note: When performing the Monthly Maintenance remotely have the on site contact perform the operation and verify they have marked the tape for the number of uses. - If a Cleaning Cartridge is needed, include this information in the Monthly Maintenance Follow Up Email. - If there is an SR to deliver and label a box of tapes and or a cleaning cartridge, perform the work necessary to complete that SR now. Note: Be certain to enter the product into the SR immediately. - Update the Network Documentation Binder Tech Notes with other relevant information from this section. - Verify that the Anti-Virus client on the server is running and scanning on a scheduled basis and that there are no issues to be addressed. - Verify that the Server's Anti-Virus client application and definitions are up to date. - Verify the Server Anti-Virus client quarantine is empty. - Verify that the Network Anti-Virus solution is providing the latest virus definitions. - Verify that all Anti-Virus clients are accepting and using the latest virus definitions. - Verify that the Anti-Spyware client / solution on the server is running and scanning on a scheduled basis and that there are no issues to be addressed. - Run Microsoft Windows Update repeatedly until all Critical System and Hardware updates are applied. NOTE: The only hardware updates we do NOT install are Tape Drivers. NOTE: If rebooting the server is required to continue with the update process or if a NIC driver is being updated, coordinate it with the Client Contact and or users for minimal impact. Use "Golden Hours" for reboots. - Run the latest version of Baseline Security Analyzer. Down load and apply all missing updates indicated. Note: When performing the Monthly Maintenance remotely, verify the on site contact has made this entry in the NDB. Note: When performing the Monthly Maintenance remotely, verify the on site contact has printed, stapled, punched and put the notes into the NDB. - If any drive is over 1.25 fragmented, schedule a one time defragmentation of that drive for 5:00 pm. Note: Server2 does a simple backup to the D drive on Server1. Backup Exec is used to so we can backup the live database. - Check the job completion time. Verify that Server1 backup starts after Server2 backup finishes. - Verify that each full server OS backup contained in the target backup set has the complete System State for this server. - Verify that the Servers Anti-Virus client application and definitions are up to date. - (If needed) Cycle the power on the firewall to be sure the maximum number of IP’s are free at all times. - Log into the CDP and verify continuous copy of data is functioning correctly and there are no flags or alerts. - Purge all old versions of files. - Deliver tape(s) to client contact to be placed offsite. - Check with Client Contact and convey status on all outstanding issues. - Discuss any recommendations based on this monthly maintenance with the Client Contact. - Draft a reminder Email to the Client Contact with the recommendations. Note: You must CC the Service Manager and "Service" mailbox. - Make a final round check with all users especially those who had issues to be resolved. - If required, create Service Requests for all unresolved issues. 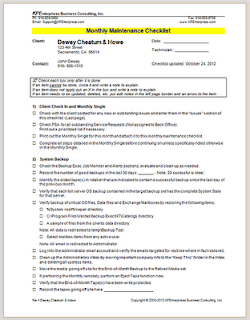 - Update this Monthly Maintenance Checklist document with all necessary revisions. Note that there are two critical items that need attention after the Monthly Maintenance is complete. One is a follow-up email to the client. You can draft this and save it as an .oft file. That way, the tech only makes minor changes, addresses the email, and ends it. Your monthly maintenance is complete. Your server's overall health is excellent. Anti-Virus protection is continuous and the definitions are up to date. All available system updates have been applied. I will follow up on . . . I created a service request for . . .
We did come across a few things know what point out . . . There are a few items we need to bring to your attention . . . Thank you and please contact us if you have any questions. Finally, you wrote down all the issues you found along the way. These need to be addressed somehow. You need to determine your company procedure for this. You might talk to the client on the spot. 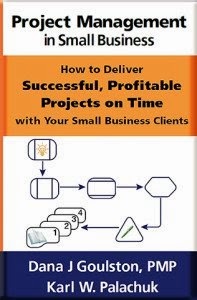 Or you might create service requests first and then talk to the client (later?) about any SRs that will result in billable labor. Or the technician on site might just create SRs and make sure the service manager talks to the client. Whatever your policy, make sure those issues are followed up. YES: This is labor intensive. You can save a lot of time with a good RMM tool such as Continuum, Level Platforms, or PacketTrap. But the most important thing - the backup - requires human attention. You can't trust the logs. You can't trust fate. And you can't trust the client to switch hard drives or tapes. You can only trust yourself to verify that this is working. The labor intensive nature of the MMC is nothing to worry about. On most servers you can do all this in an hour or less. It is time well spent and prevents future problems. It's great for the client relationship, too. And if nothing else will convince you to go buy an RMM tool, this will. When you have 20 servers that need monthly maintenance, expect to spend 20-25 hours a month executing this. Plus travel time. Now reduce that to 15 minutes each when all you have to check is the backup. Now you're down to 5-6 hours a month. Trust me, a good RMM tool will pay for itself! * The "Monthly Single" is a specific task done each month across all clients. I'll cover this in a future article. Right now it's scheduled for February 2013. Stay tuned. 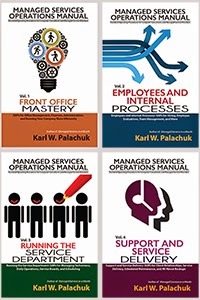 These SOP Friday posts are a great resource for all service companies. They also serve to highlight how well your business must be organised. Thank you sir. Some version of the monthly maintenance checklist is the first checklist I ever created in my business.